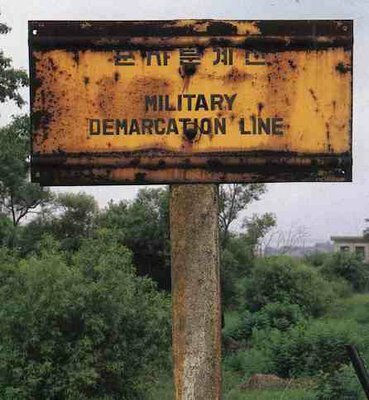 What could, or should, become of the Korean demilitarized-zone as tensions along the border ease further towards reconciliation? It's been considered "the most dangerous place on earth" for nearly every bit of the last fifty years, with over two million soldiers keeping it under constant watch, and possibly the largest looming artillery reserve ever targeted at a single city. The North Korean arsenal has been said to be capable of raining down an estimated 30,000 shells per hour on Seoul, which could wipe out the capital of South Korea in less than hour. However, five decades of border-flexing have fortified nothing but a ridiculous military stalemate between the two sides, sequestering an unmanaged landscape in the middle behind an intricate elaboration of security walls, sniper towers and reconnaissance nests, millions of yards of barbed wire coil, thousands of tank traps, and conceivably every type of landmine ever invented. But, the 225-kilometer buffer zone has all along continued to flourish ecologically as a result of this prolonged quarantine, producing some of the world's rarest species of flora and fauna and animal life, and perhaps it even conjures a reconceived notion of 'the sublime' as our hopes of the DMZ one day transforming into 'the paradise' we tend to fancy in the face of more-or-less sensational devastation. A few years ago, a number of news articles reported on the explosion of biodiversity which clearly benefited the most within this volatile strip of no-man's land, ironically giving way to the most heavily secured plot of natural paradise contained anywhere on the planet, whom some have suggested become permanently protected as a U.N. World Heritage Site. Bruce Sterling referred to this walled-off paradise as an "involuntary park," and a crucial piece of real estate that may not only be one of Asia's most important remaining wildlife refuges, but, also, symbolizes a critical scenic heritage and historic crux in allowing Korea to overcome the cold war symbolism that has presided over its regional identity to the point of polarized absurdity. 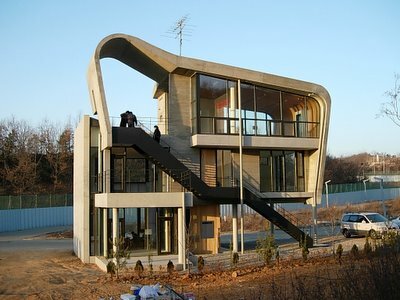 The New York Times wrote a piece this weekend on the peripheral building boom in Paju, a city along the southern edge of the DMZ (just north of Seoul), where businesses, developers and other communities are assembling in droves in response to the surging costs of real estate surrounding the epicenter of South Korea's fastly growing economy. "South Korea's industrial production grew 12.2 percent in November while its stock market rose 51.2 percent in 2005, and it's government now forecasts 5 percent growth in 2006. Unemployment, already a low 3.5 percent, is expected to fall further, pushing South Korean wages up near Japan's." With a $5 billion LCD screen production plant wrapping up in Paju, a new trend in apartment buildings on the rise, the 'English Village', (a new 65-acre language-teaching theme park converted out of an old hilltop machine-gun nest), and a major highway project being built in conjunction with restrictions lifted on approximately 120 military reservations outside the DMZ, South Korea's economy has tapped various new access points converging north that are beginning to create bridges with their virtually bankrupt northern rivals, whether NK likes it or not. Fearful of a future encroach by development, coalitions including environmentalists like Professor Willem van Riet of South Africa's 'Peace Parks Foundation' (PPF), Representative Curt Weldon (Pa.), and even media mogul Ted Turner, have all proposed turning the DMZ into a bio-sanctuary or "peace park" to emphasize an anti-conflict balance of eco-tourism and strict wildlife preservation, and as a means for closing the gap towards reunification. Their proposals have been explored in conjunction with the DMZ Forum, an international NGO devoted to transforming the DMZ from a symbol of war into "a place of peace among humans and between humans and nature." Perhaps two of the most intriguing projects to emerge with this momentum are Seoul's New Songdo City, or "U-city" (the "ubiquitous city"), which aims to be a techno-utopian business-center test-bed for city-wide digital infrastructure, and the Heyri Art Valley, a funky arts colony promoting experimental architecture and community design as a means for reclaiming the off-limit fringes of the DMZ border. From this quote printed in a recent article in the Financial Times, "This village can help resolve some of the tensions through culture," as usually, it is emergent culture along the border that turns security fences into porous membranes for cross-cultural growth and exchange, and, "One day, maybe North Koreans can have concerts and exhibitions here." Ideally, if given the opportunity to reclaim the entire DMZ as a way of helping to reunify the two Koreas, then what sorts of projects should regional planners be exploring over there? 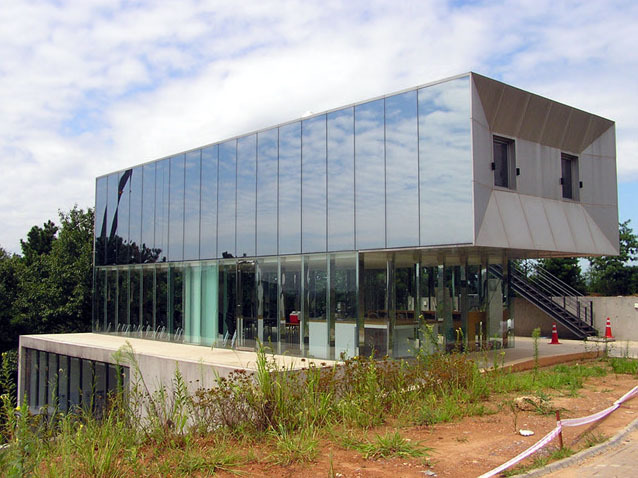 What roles can and should architecture play in reinventing this post-military context? How might issues of land use and ownership, or foreign policy, come to be resolved by these projects? There's obviously potential for the DMZ to be turned into a monumental park space, watched over by a new omniscient sense of neutrality, where one of the most heavily fortified borders in our history can be turned into a unique membrane for unprecedentedd cooperation. In this sense, the Korean DMZ has, at least theoretically, afforded tremendous opportunity for achieving a new partnership given the significance of all that stands to be gained through mutual diplomacy there. But, given Kim Jong's track record in that department, even that hope would remain to be seen. It would take an enormous civic effort for the two countries to come together responsibly and clean up their mess, de-mine the future eco-topia of a New Eden in their midst, but, should they ever manage to pull it off Korea's DMZ could come to represent something truly historic and remarkable. So, how can an architectural leadership help foster this type of reconciliatory mood, or help to revive diplomacy and trust, create a thriving post-border cultural movement devoted to protecting the vast environmental treasure that stretches preciously between them? How can a recontextualized DMZ build new socio-political ties, serving both north and south equally, without the south being tempted into using an opened up DMZ as a new stage for economic posture? How can one of the "most dangerous places on earth" be made to prove in the end a great example of how to manage one of the hottest politically contested spaces of our times, and serve as a model for the territorial suture of similar volatile disputed border zones? Do you have a grand vision for a Korean post-DMZ paradise, I'd love to hear it. I think if it were up to me, I'd allow one. One. I'd place it right on the border, or across it. 20,000 sq ft of structure on one side, and another 20,000 overlapping the other. I would also put it right over one of those underground bunker tunnel complexes. So, the McMansion inhabitants can tend to their McMansion wine cellars which will be converted out of the tunnels. The monstrosity itself would somehow be made to resemble the tunnels underneath it, as a strange exstension of them, becoming an unearthed mirror-structural reflection of the dispersed mansionesque underground complex there. This thing would be an art project, the grossest McMansion model I could build, to reflect on exported models of american suburbia, sprawl borders and environmental poaching, and a heinous mansion McMockery of the crazy underworld which still exists below it. Keller Easterling wrote a semi-related essay in the recent book Architourism, titled "North Korea Love Boat". It looks like that may be the same piece as his essay in Harvard Desgin Magazine (Fall 2002), as noted on his site. 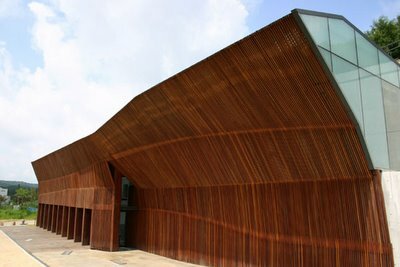 It also appears he had a studio in 2001/02 at Yale that looked at the DMZ in Korea. Anyways, the Architourism piece mainly talks about Mount Kumgang in North Korea, a mountain that is to Koreans as Fuji is to Japanese. South Koreans have visited Kumgang via a Love Boat-esque cruise liner for years, and recently they've been able to make the voyage by land. The Kumgang Tourist Region is being developed mainly by Hyundai, who is going to build sixteen car factories in the north, a technology park just north of the DMZ and will supposedly have driling rights in the North. Oh, and they're giving the North a bunch of free tvs. 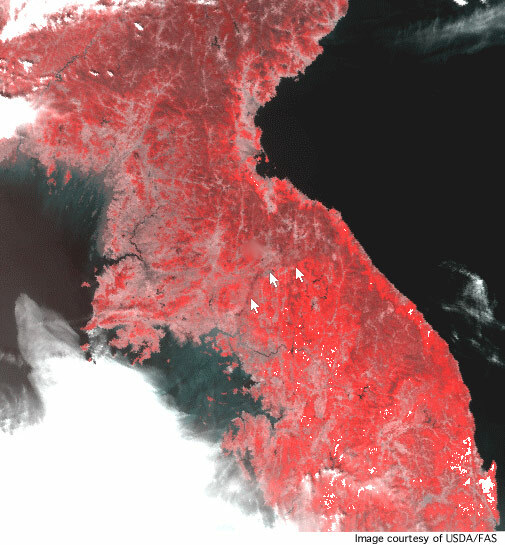 Easterling compares Kumgang to the Vatican, an isolated place with political asylum and freedom from the forces that characterize the North. Though that wouldn't make me wanna visit. Ultimately, it seems that North and South will reunite, but with what model? With what focus? The Kumgang tourism points to the market system and commodification of place and experience. But somehow I don't see that going down to easy for the North and Kim Jong Il. 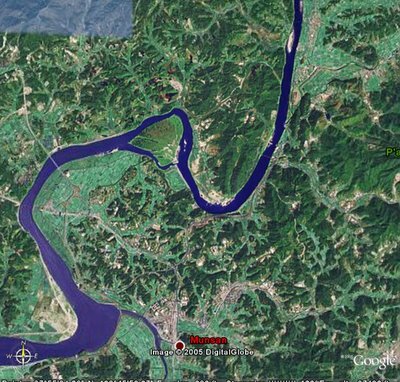 Perhaps this might infer what could be done at the DMZ, specifically a coastal link between North and South that preserves the natural inland features that currently exist along the DMZ. Develop those areas along the water and keep the areas between untamed. 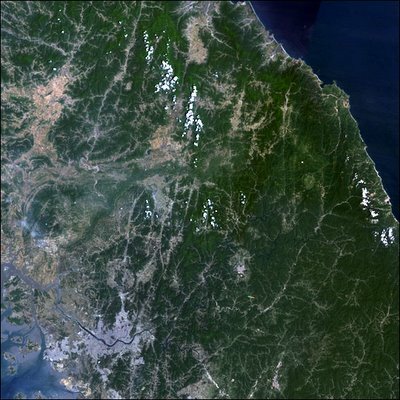 Lots of South Korea is left unbuilt because certain mountains and terrains are viewed as sacred, it's just a matter of convincing them that something with as difficult a history as the DMZ should be considered sacred as well. thanks for that great reference, I will have to check more into Easterling's writings & studio. And I didn't know about Kumgang's true significance, either, which could be a critical vehicle to a reinvented regional identity, to be sure. I think your notion of the sacred is a firm starting point, of which both sides can relate to, and through, to further develop diplomacy, and will force them to put aside their differences for a greater cause of mutual respect. Coastal development is probably inevitable too, but as you say that could be a good way of preserving their inland Eden. I'll have to read the Easterling and get back to you on this. Thanks for posting the good stuff, man.